Question: What is Amazon Resource Names (ARNs)? 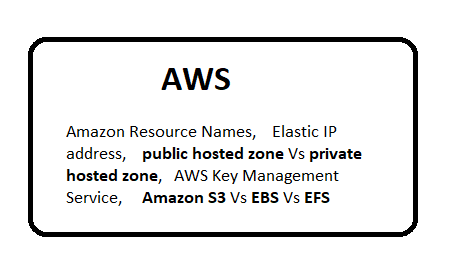 Amazon Resource Names (ARNs) uniquely identify AWS resources across all of AWS resources, such as in IAM policies, Amazon Relational Database Service (Amazon RDS) tags. Question: Give few sample of ARN Format? Question: Explain syntax of ARN Format? partition: Standard AWS regions the partition is aws. service: The service namespace that identifies the AWS product like Amazon S3, IAM, or Amazon RDS. account: Account id from where its generated. resource: The content of this part of the ARN varies by service. It often includes an indicator of the type of resource. Question: What is Elastic ip address? Question: What is public hosted zone? Question: What is private hosted zone? Question: What is Amazon RDS Read Replicas? Amazon RDS Read Replicas provide enhanced performance and durability for database which makes elastically scale out beyond the capacity constraints of a single DB instance for read-heavy database workloads. You can create one or more replicas and serve high-volume application read traffic from multiple copies of your data. Read replicas are available in Amazon RDS for MySQL, MariaDB, and PostgreSQL as well as Amazon Aurora. Question: What is Amazon RDS Multi-AZ Deployments? Amazon RDS Multi-AZ deployments provide enhanced availability and durability for Database (DB) Instances, making them a natural fit for production database workloads. When you provision a Multi-AZ DB Instance, Amazon RDS automatically creates a primary DB Instance and synchronously replicates the data to a standby instance in a different Availability Zone (AZ). Each AZ runs on its own physically distinct, independent infrastructure, and is engineered to be highly reliable. Question: What AWS Key Management Service (KMS)? KMS is a managed service where you can create and control the encryption keys used to encrypt your data, and uses FIPS 140-2 validated hardware security modules. KML is integrated with most other AWS services to help you protect the data you store with these services. Question: What is difference between Amazon S3, EBS and EFS ? Amazon S3: Amazon S3 stores data as objects. Each object in the storage contains a header with associated sequence of bytes from 0 byte to 5 TB. EBS: EBS stores data as blocks of the same size and organizes as similar to a traditional file system, you can use it with EC2 instance. EFS: EBS may be good for setting up a drive for virtual machines and and S3 is good for storage and EFS is good for both.